Bagby"You are a white supremacist"
COLUMBIA, Mo 2/6/18 (Beat Byte) -- Calling herself an "Uncomfortable Black Mother," Columbia resident Suzanne Bagby leveled some of the harshest criticism yet at city manager Mike Matthes for his racially-charged presentation at the Columbia Values Diversity Breakfast (click this link for details). 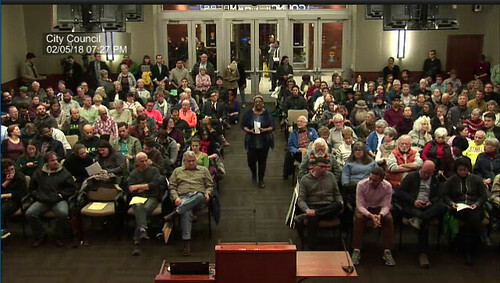 Looking Mr. Matthes straight in the eye, Bagby asked him to resign at last night's standing room only Columbia City Council meeting. 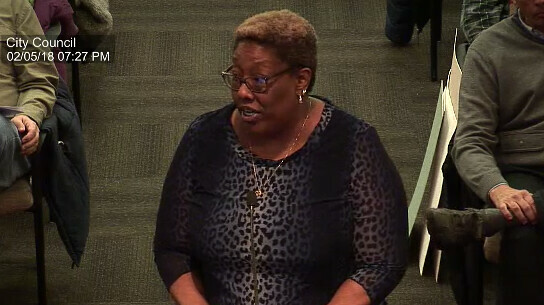 Mizzou doctoral student Sarah Senff echoed Bagby's comments, imploring Council members to "find a city manager prepared to support changes" that would "eliminate a deadly bias: associations of blackness with poverty and violence and drug use. Unfortunately, I am doubtful such healing will come under the leadership of city manager Mike Matthes." Columbia NAACP leaders Mary Ratliff and Valerie Shaw, meanwhile, defended Mr. Matthes and spoke in support of his presentation. The Heart Beat will cover their comments later this week. Bagby's three-minute speech is transcribed from the City Council video. 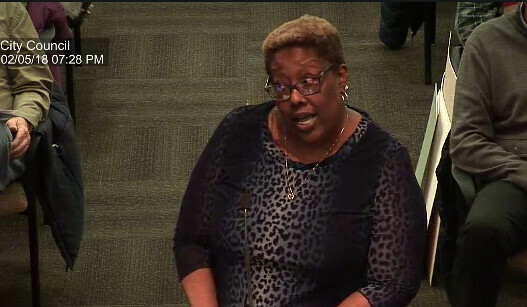 "I am here to address Mr. Matthes about his Diversity Breakfast speech, 'The Uncomfortable White Man,'" she began, directing her eyes and comments at the city manager. Approaching Council Podium"As an uncomfortable black mother, I will not apologize for what you say makes you an uncomfortable white man," Bagby continued. "You are uncomfortable with the way our children choose to dress and express their heritage? Let me explain to you what uncomfortable is: As an uncomfortable black mother, when our children leave the house, we are uncomfortable. "We worry whether or not our child is going to be racially profiled that day, or not make it home. "Let me explain to you, Mr. Matthes, what an uncomfortable black mother really is. "As an uncomfortable black mother, uncomfortable is having to explain to my child he didn’t get the job because of the way he chooses to wear his hair. "As an uncomfortable black mother, uncomfortable is having to tell your child we are unable to move because we live in a city that still supports segregation. "As an uncomfortable black mother, uncomfortable is when your child comes home and tells you that when he enters a store, bank or restaurant, you, the Uncomfortable White Man, move aside and look at him funny. "As an uncomfortable black mother, uncomfortable is being a Columbia resident and once again being victimized and disrespected by you Mr. Matthes, an awkward, uncomfortable white man. Making a Point"As an uncomfortable black mother, uncomfortable is a joyful anticipation to celebrate at the diversity breakfast and having Dr. King’s Dream disrupted by you, the Uncomfortable White Man. "As an uncomfortable black mother, uncomfortable was listening to you, Mr. Matthes use ridiculous and racist examples about your perceptions of black people. "As an uncomfortable black mother, uncomfortable is that you continue to misrepresent and distract from the root causes of economic and racial injustice issues. As an uncomfortable black mother, we often say it -- but apparently you can't: racism. "Say it with me, Mr. Matthes: Racism. Racism is what you will not and cannot say. "As an uncomfortable black mother, I will not allow you to to try and turn your racism around and blame it on us, African Americans. Stop making us at fault for your discomfort! "As an uncomfortable black mother, I am telling you -- that you are NOT an uncomfortable white man. You are a white supremacist. "I am comfortable asking you today for your resignation, so our city can begin the healing we need to put your ignorance at its end. I'm an engaged, uncomfortable black mother and I'm awoke." Click all pix for larger.